While we are celebrating the 30th anniversary of MSX today, in Japan the party had already started. Weekly ASCII Magazine has already dedicated three extensive articles on the 30th anniversary of MSX. And they turn out to be quite an interesting read! 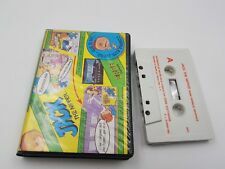 The first article sets off with 'Nishi VS Mayoshi Son - the untold history of MSX'. Now we probably all know who Kazuhiko Nishi is, but Mayoshi Son might be a bit less familiar; he is the founder of Japanese telecommunications and Internet corporation Softbank. The article mentions June 16th as the date the MSX standard was officially announced during a press conferance in Tokyo, attended by 14 Japanese consumer electronics manufacturers, Bill Gates and the then 27 year old Kazuhiko Nishi. However, the news that an American company, Microsoft, was so deeply involved in a new standard from Japan did not settle well. Mayoshi Son started to succesfully persuade Japanese manufacturers that did not participated in the MSX project to join forces and develop another standard that could oppose MSX. Fearing another videotape format war, something had to be done. It took several days of negotiating behind the scenes to let things cool down and reach a settlement. On June 27th, all previously doubting or disgruntled manufacturers stopped their protest and claimed to support the MSX standard. On October 6th, 1983, ASCII published the very first MSX magazine in the world: MSX Magazine 0. As there was actually very little to write about yet, the magazine focused on visions of the future and suggestions of how an MSX could look. The first actual MSX computer to be put to market was the ML-8000, released by Mitsubishi. But even though the 8bit computer could measure itself with other home computers and its goal of standardization was very well released, the first large drawback happened 3 months before first MSX was even available. On July 15, 1983, Nintendo released their immensely succesful Nintendo Entertainment System. It was a matter of "can only game" versus "not only games" that should have set MSX apart from game consoles, but clearly the market did not agree. Very soon a "NES VS MSX" magazine appeared, fueling the atmosphere of confrontation between the two. The second article, issued on June 18th, gives a quite complete summary of the history of MSX, mentioning all generations of the MSX, including the One Chip MSX. It mentions the MSX had a rough start with the MSX1, due to high prices and unimpressive specifications compared to the game-only console Nintendo's NES was - combined with tough competition from NEC, Sharp and Fujitsu's personal computers. Even when MSX2 was released, initially at an extremely high price of ¥ 100,000 (~ $1,000 at the time). The breakthrough came in October 1986 with the release of the Panasonic FS-A1, which had a list price of ¥ 29,800 (~ $ 300,-). It was an instant hit and initiated the heydays of MSX. Countless games were released on a monthly basis since then until the end of the 1980s. Another important milestone for MSX was the release of the Sony HB-F1XD in 1987, which offered a built-in Floppy Disk Drive at a list price of ¥ 54,800 (~ $ 560,-). And then, as we all know, the MSX3 just did not happen. The MSX2+ just did not offer enough with its V9958 and (optional) MSX-MUSIC, and for the turboR with its amazing R800 processor the VDP was just not on par with the rest of the system. While users were expecting a home computer which could match a Super NIntendo, and the popularity of the NEC PC-9801 and Sharp X86000 increased, MSX started to lose its position in the market. It even asks readers to comments whether or not a second batch of One Chip MSX computers has to be produced, as the steep prices on Yahoo Auctions clearly show there is quite some demand. The article closes with praising the MSX hobbyists that are keeping the MSX platform alive. A third article, issued on June 25th, dives more into the history of MSX. It mentions Toshiba as one of the important forces behind MSX and their MSX-Engine as the 'original one chip'/system on a chip, implementing a Z80, TMS9918A, Intel i8255 and AY-3-8910 on a sincle LSI. The article mentions that although about 5 million MSX computers were sold, the amount of MSX-Engines sold actually far exceeds this amount, hinting the cheap LSI was used in many other appliances such as Pachinko machines and word processor/video related equipment. As a result of this, even though Toshiba stopped producing MSX computers very soon, Nishi tends to call Toshiba the company that profited the most from MSX. This allowed Toshiba to further optimize the technology of super integration, resulting in the (co)development of the Playstation 2's Emotion Engine and Playstation 3's Cell processor. In about a direct quote as Google Translate allows, the article states "That's right, semiconductor technology of Toshiba that was cultivated in MSX was to support the game industry after. It may be no exaggeration to say that if it were not for MSX , there would be no PS2 and PS3". Who are we to disagree? Wow, nice story and very informative. Good job! What killed MSX was the lack of vision in long term (10~15 years). MSX2 should had included FM-PAC already, too bad Panasonic didn't released it in 1986 too (it was in 1987). Also, the super slow (and limited) VDP killed CPU and the computer altogether. The article mentions SNES, but that was years after! In 30 Oct 1987 they had PC Engine (dual GPU, hence much superior to VDP) and also dual CPU, ultra portable and all at mere $199. Of course, on MSX2+ as computer you could use it for programming (limited anyway), but it was already undated to what they have at that time only perhaps for the FM-PAC, but even so, for a short period of time (new sound chips and CD was coming). Then don't forget about Atari ST (June 1985) and Amiga (July 1985) too. A500 (best selling) popped in 1987. Kazuhiko Nishi as starter, also helped to MSX to die sooner than expected, or at least, to be very undated/limited to what they/we had at the time. MSX only managed to survived a bit more thanks to some wonderful games it had specially from Konami, T&E Soft, Compiler, among others. @Gradius2: The article mentions NES not SNES.